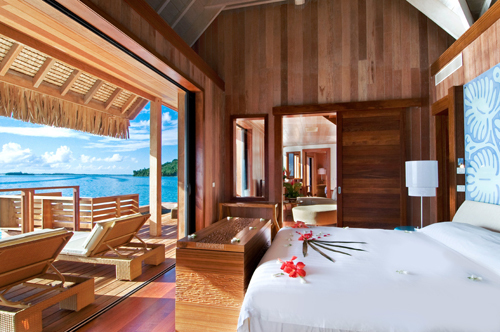 Even if you’re not getting married in Tahiti you can still invite the folks, the cousins, and what about the neighbors for a celebratory stay in French Polynesia’s latest resort manse: one of two Presidential Overwater Bungalows that opened recently at Hilton Bora Bora Nui. The mighty bungalows get their buzz strength from debuting as the first bi-level, overwater guest accommodations in the archipelago. And, indeed, there is room to spare in these spreads, far beyond the two bedrooms, three bathrooms, private pool, sundecks galore and personal Pacific Ocean to dive into. The mini-mansions made their close-up in December as a counter-offer to the Royal Villas at the St. Regis and the luxury beachfront villas available at the new Four Seasons Bora Bora. They measure more than 3,000 square feet with all the conveniences of a modern Manhattan residence: mp3 players, assorted satellite TVs, Wifi, voicemail, cocktail bars, coffee service and, well, diving equipment. Plus each villa comes with a couple of things most abodes do not: private check-in, welcome and farewell gifts, a bottle of Champagne and a fresh fruit platter waiting in the living room, complimentary in-villa massages in the “Well-Being” room (where there is a massage table, sofa, a sauna and a spacious bathroom), and twice-daily turndown service. Hilton Hotels purchased the former Starwood property last year and the property’s 120 rooms, suites and villas underwent a general refurbishment. The resort extends along some 16 hillside acres providing views of the ocean and atolls from a variety of vantages, including the hilltop spa. It’s is an easy 15 minute “cruise” from the airport (which is a 45-minute flight from Papeete), and that said, anywhere you want to go in this remote Tahitian string of pearls requires the benefit of a motorboat rather than wheels. Getting out around Bora Bora – whether dining at Bloody Mary’s across the lagoon (a lively crowded seafood restaurant where patrons have their pick grilled, imbibe decorative alcoholic fruit drinks and walk on sand floors), feeding the mouths of friendly stingrays or tossing chum to the not so friendly sharks, can be arranged at the hotel at a moment’s notice. But most of the time will be spent on the beach, on personal decks, dipping in the property’s stunning 1000 square meter infinity pool, or swimming with the fish in clear waters accessed right from the edge of your deck. The two new overwater Presidential Villas run around $4,500 per night as a published rate. This entry was posted in Bora Bora, Destination Wedding and Honeymoons, Hotels and Resorts, Tahiti and tagged French Polynesia resort, Hilton Bora Bora Nui.